"Shahanshah" redirects here. For other uses, see Shah (disambiguation) and Shahanshah (disambiguation). Shah (/ʃɑː/; Persian: شاه‎, translit. Šāh, pronounced [ʃɒːh], "king") is a title given to the emperors, kings, princes and lords of Iran (historically known as Persia in the West). It was also adopted by the kings of Shirvan (a historical Iranian region in Transcaucasia) namely the Shirvanshahs. It was also used by Persianate societies such as the rulers and offspring of the Ottoman Empire (spelled as Şah and Şeh in the modern Turkish language), Mughal emperors of the Indian Subcontinent, the Bengal Sultanate, as well as in Afghanistan. In Iran (and the Greater Iran region) the title was continuously used; rather than King in the European sense, each Persian ruler regarded himself as the Shahanshah (Persian: شاهنشاه‎, translit. Šāhanšāh, "King of Kings") or Padishah (Persian: پادشاه‎, translit. Pādešāh, "Master King") of the Persian Empire. Other words for King in other Iranian languages, like Sogdian xšyδ, Kurdish, Parthian and Gilaki šāh, Bactrian šao, Luri and Mazandrani ša and Pashto pača are also from the same root. The word descends from Old Persian xšāyaθiya "king", which (for reasons of historical phonology) must be a borrowing from Median, and is derived from the same root as Avestan xšaϑra-, "power" and "command", corresponding to Sanskrit (Old Indic) kṣatra- (same meaning), from which kṣatriya-, "warrior", is derived. The full, Old Persian title of the Achaemenid rulers of the First Persian Empire was Xšāyathiya Xšāyathiyānām or Šāhe Šāhān, "King of Kings" or "Emperor". Mohammad Reza Pahlavi, Shahanshah of Iran from 1941 to 1979, was the last ruler to hold the title of shah. Šāh, or Šāhanšāh (King of Kings) to use the full-length term, was the title of the Persian emperors. It includes rulers of the first Persian Empire, the Achaemenid dynasty, who unified Persia in the sixth century BC, and created a vast intercontinental empire, as well as rulers of succeeding dynasties throughout history until the twentieth century and the Imperial House of Pahlavi. While in Western sources the Ottoman monarch is most often referred to as a Sultan, in Ottoman territory he was most often referred to as Padishah and several used the title Shah in their tughras. Their male offspring received the title of Şehzade, or prince (literally, "offspring of the Shah", from Persian shahzadeh). The full title of the Achaemenid rulers was Xšāyaθiya Xšāyaθiyānām, literally "King of Kings" in Old Persian, corresponding to Middle Persian Šāhān Šāh, and Modern Persian شاهنشاه (Šāhanšāh). In Greek, this phrase was translated as βασιλεὺς τῶν βασιλέων (basileus tōn basiléōn), "King of Kings", equivalent to "Emperor". Both terms were often shortened to their roots shah and basileus. In Western languages, Shah is often used as an imprecise rendering of Šāhanšāh. The term was first recorded in English in 1564 as a title for the King of Persia and with the spelling Shaw. For a long time, Europeans thought of Shah as a particular royal title rather than an imperial one, although the monarchs of Persia regarded themselves as emperors of the Persian Empire (later the Empire of Iran). The European opinion changed in the Napoleonic era, when Persia was an ally of the Western powers eager to make the Ottoman Sultan release his hold on various (mainly Christian) European parts of the Ottoman Empire, and western (Christian) emperors had obtained the Ottoman acknowledgement that their western imperial styles were to be rendered in Turkish as padishah. 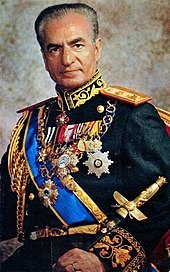 In the twentieth century, the Shah of Persia, Mohammad Reza Pahlavi, officially adopted the title شاهنشاه Šāhanšāh and, in western languages, the rendering Emperor. He also styled his wife شهبانو Shahbānu ("Empress"). Mohammad Reza Pahlavi was the last Shah, as the Iranian monarchy was abolished after the 1979 Iranian Revolution. From the reign of Ashot III (952/53–77), the Bagratid kings of Armenia used the title shahanshah, meaning "king of kings". The title Padishah (Great King) was adopted from the Iranians by the Ottomans and by various other monarchs claiming imperial rank, such as the Mughals that established their dynasty in the Indian subcontinent. Another subsidiary style of the Ottoman and Mughal rulers was Shah-i-Alam Panah, meaning "King, refuge of the world". The Shah-Armens ("Kings of Armenia", sometimes known as Ahlahshahs), used the title Shāh-i Arman (lit. "Shah of Armenia"). The kings of Georgia called themselves shahanshah alongside their other titles. Georgian title mepetmepe (also meaning King of Kings [Mepe-king in Georgian]) was also inspired by the shahanshah title. Shahzadeh (Persian شاهزاده Šāhzādeh). In the realm of a shah (or a more lofty derived ruler style), a prince or princess of the blood was logically called shahzada as the term is derived from shah using the Persian patronymic suffix -zādeh or -zāda, "born from" or "descendant of". However the precise full styles can differ in the court traditions of each shah's kingdom. This title was given to the princes of the Ottoman Empire (Şehzade, Ottoman Turkish: شهزاده) and was used by the princes of Islamic India (Shahzāda, Urdu: شہزاده) such as in the Mughal Empire. It is to be noted, however, that the Mughals and the Sultans of Delhi were not of Indian origin but of Mongol-Turkic origin and were heavily influenced by Persian culture, a continuation of traditions and habits ever since Persian language was first introduced into the region by Persianised Turkic and Afghan dynasties centuries earlier. Thus, in Oudh, only sons of the sovereign shah bahadur (see above) were by birth-right styled "Shahzada [personal title] Mirza [personal name] Bahadur", though this style could also be extended to individual grandsons and even further relatives. Other male descendants of the sovereign in the male line were merely styled "Mirza [personal name]" or "[personal name] Mirza". This could even apply to non-Muslim dynasties. For example, the younger sons of the ruling Sikh maharaja of Punjab were styled "Shahzada [personal name] Singh Bahadur". The corruption shahajada, "Shah's son", taken from the Mughal title Shahzada, is the usual princely title borne by the grandsons and male descendants of a Nepalese sovereign, in the male line of the Shah dynasty. For the heir to a "Persian-style" shah's royal throne, more specific titles were used, containing the key element Vali Ahad, usually in addition to shahzada, where his junior siblings enjoyed this style. Shahbanu (Persian شهبانو, Šahbānū): Persian term using the word shah and the Persian suffix -banu ("lady"): Empress, in modern times, the official title of Empress Farah Pahlavi. Shahmam (Persian شهمام, "Šahmām") : Empress mother. Shahdokht (Persian شاهدخت Šāhdoxt) is also another term derived from shah using the Persian patronymic suffix -dokht "daughter, female descendant", to address the Princess of the imperial households. Shahpur (Persian شاهپور Šāhpu:r) also been derived from shah using the archaic Persian suffix -pur "son, male descendant", to address the Prince. Şehzade (Ottoman Turkish), (شاهزاده): Ottoman Turkish termination for prince (lit; offspring of the Shah) derived from Persian Shahzadeh. Satrap, the term in Western languages for a governor of a Persian province, is a distortion of xšaθrapāvan, literally "guardian of the realm", which derives from the word xšaθra, an Old Persian word meaning "realm, province" and related etymologically to shah. Maq'ad-i-Shah, (Persian مقعد شاه Maq'ad-i-Shah), the phrase from which the name of Mogadishu is believed to be derived, which means "seat of the Shah", a reflection of the city's early Persian influence. The English word "check", in all senses, is in fact derived from "shah" (from Persian via Arabic, Latin and French). Related terms such as "checker" and "chess" and "exchequer" likewise originate from the Persian word, their modern senses having developed from the original meaning of the king piece. ^ Hasan, Perween (2007). Sultans and Mosques: The Early Muslim Architecture of Bangladesh. ^ An introduction to Old Persian (p. 149). Prods Oktor Skjærvø. Harvard University. 2003. ^ Old Persian. Appendices, Glossaries, Indices & Transcriptions. Prods Oktor Skjærvø. Harvard University. 2003. ^ M. Mo’in. An Intermediate Persian Dictionary. Six Volumes. Amir Kabir Publications, Teheran, 1992. ^ Clifford Edmund Bosworth "The New Islamic Dynasties: A Chronological and Genealogical Manual". "The Shāh-i Armanids", p. 197. ^ "South Asian Sufis: Devotion, Deviation, and Destiny". Retrieved 2 January 2015. ^ David D. Laitin, Said S. Samatar, Somalia: Nation in Search of a State, (Westview Press: 1987), p. 12. Look up shah in Wiktionary, the free dictionary.